If you’re going to be in the area, Dr. Michael Wolff will be speaking at Central New Mexico Community College, next Wednesday, October 21. 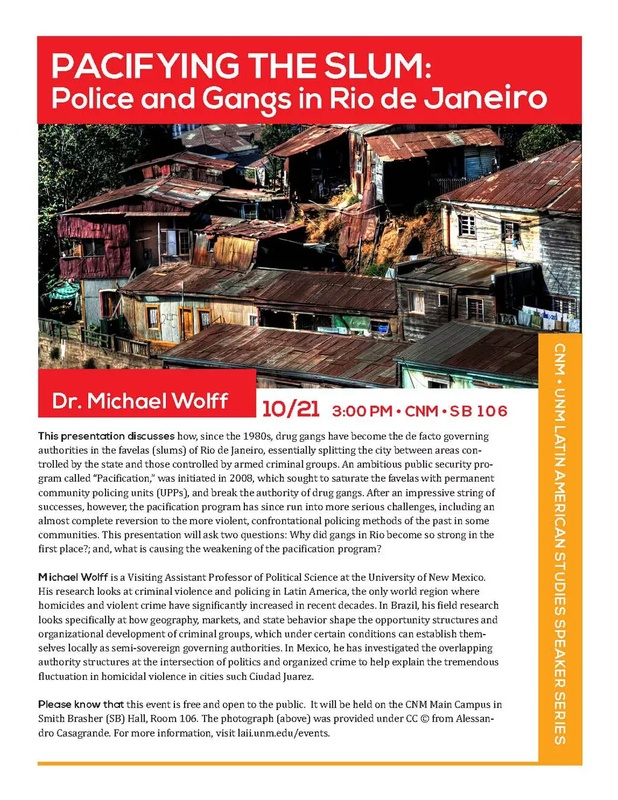 The topic he’ll be presenting is his work on the “pacification campaigns” in Rio de Janeiro’s slums by state forces against local criminal organizations. It should be a great talk. Dr. Wolff, who teaches at the University of New Mexico, has also researched the politics of violence and organized crime in Mexico, particularly in Ciudad Juárez. For more information, check out the flyer. The talk is part of the Latin American Speaker Series, hosted jointly by CNM and UNM.